“People may not remember exactly what you did, or what you said, but they will always remember how you made them feel.” Dr. Thomas L. Garthwaite, Under Secretary of Health. The other day my family and I were revisiting the events of this Christmas and discussing our favourite memories/gifts etc. I tend to really enjoy the simple moments, like the evening of the last day of school for my guys – we all sat around the Christmas tree and ate pizza and caught up on the week’s event. Another moment was when we gathered to go to bed on Christmas Eve and read from the Bible, Luke Chapter 2. With the pending new year, Christmas 2013 is virtually over and my mind turns to the follow up – or shall I say the clean-up that will ensue. This is always the saddest part of the holiday, as we pack away “old friends” like the nutcrackers and the special tree ornaments. This year, I was given a new friend, one I will cherish for years to come. It was a simple thing and a kind and unexpected gesture…and it came from someone I do not even know that well. You see, the week before Christmas as I sat in my office intently dealing with some work drama I heard a light tap on my office door. There stood one of my colleagues, a talented young man carrying a small bag in his hand. Quiet and polite to the extreme, he asked if he could come in. “Of course, I said, what can I do for you?” He handed me the bag as he explained that he and his wife had been visiting one of our famous chapels in the city and had bought something for me. “For me?” I asked why. 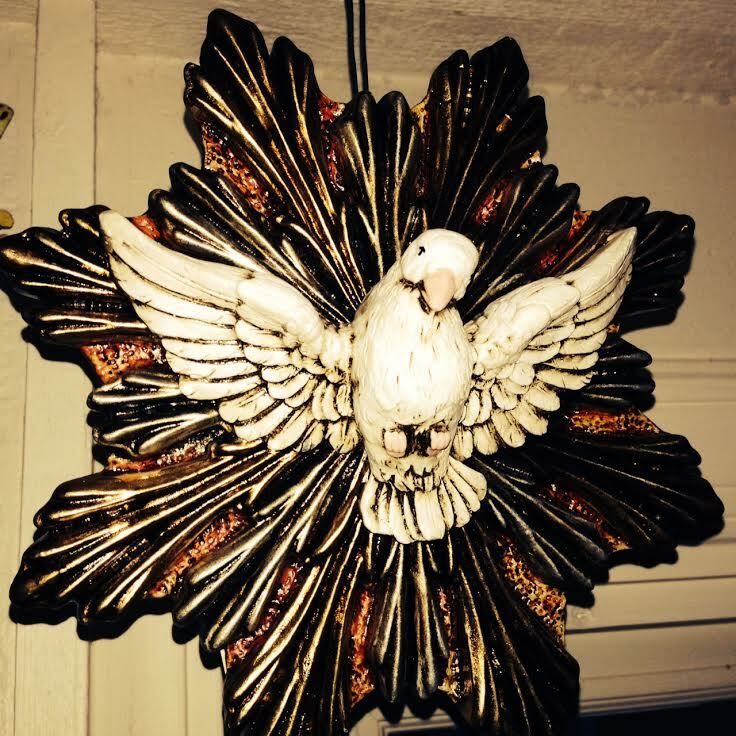 As soon as I arrived home that evening, I hung the dove in a window in my sun room, where she could preside over the Christmas festivities in the household. I enjoyed seeing her there these past few weeks. This morning while pondering our clean-up task ahead, I revisited my new friend the dove and was reminded of something my husband and I have taught our children. The actions we take in our lives can be like the rhythms of a pond. Our choice will affect others, both positively and negatively. We can choose to make soft ripples, carrying one another along gently or stir up fierce waves and sink one another.